Since the E-coli scare ive stopped buying spinach. When I looked into my pantry I found a can of collard greens that I had bought a while ago. So decided to make spinach dal with it. Also I like beetroots a lot but grating them usually messes my counter and my hands turn red too. 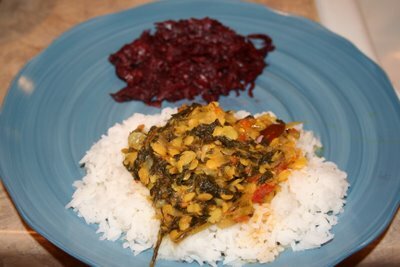 So I dont buy it often but since its very healthy I decided to make it along with the dal. Heat oil in a pressure pan and add chopped onions and green chillies. Once the onions turn translucent add chopped tomatoes and wait till it starts to turn mushy. Then add spinach, thur dal, sambar powder, turmeric, chilli powder, tamarind extract and 3 cups of water and pressure cook for 3 whistles. In a seperate pan add 1 tsp of oin and the seasoning ingredients. Once the mustard starts to splutter add the seasoning to the spinach dal mixture and serve it hot with rice. Heat oil in a pan and add the mustard seeds and split urad dal. When the mustard starts to splutter add chopped onion and fry till it begins to turn golden brown. 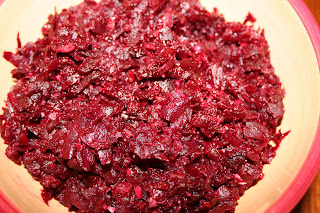 Add grated beetroot, salt and 1 cup water and cook in low heat till the beetroot changes color and the raw taste disappears. Serve with rice or roti. This can also be used as a filling for veggie rolls or Indian burritos. Yummy! Two recipes in one!! I love beets,don't mind the red at all! !Looks delicious, I will make them! !Thanks Deepz!! hi deepz,I just read ur spinach dhal..I tried this n this tastes different n yummy but b4 that,I think a small correction if I am not wrong the seasoning part shud hav red chillies not 1 tsp,i think it shud be the count of red chillies...Am I right or wrong? ?